This is a mostly routine/unexciting week for us until Sunday when we'll celebrate our 6 year wedding anniversary. We're still trying to decide what to do for our anniversary. All these great restaurants in San Diego get together for San Diego Restaurant Week (SDRW) a couple times a year. We celebrated my 31st birthday at their kick off party in September and the 10th annual SDRW starts on our anniversary this year. All of the participating restaurants have preset menus for discounted prices, we just have to choose one! Anyone in SD have a recommendation? 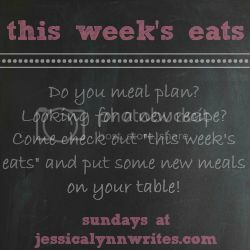 I'm linking up with Jessica again this week to share my meal plan. Head over to see what everyone's cooking this week! I almost put an orange chicken on our menu for this week, but waffled at go-time. (mmmm I still have waffles on my mind from this morning). I did, however, pin that chicken tortilla soup! Hope you find a great place for an anniversary dinner!